Marcel Breuer’s 1966 Whitney Museum of American Art under restoration, New York, November 24, 2015. Photo: Chris Heins. IN THE FALL OF 1963, presenting his vision for a new Whitney Museum of American Art in New York, Marcel Breuer described a structure that would play the role of mediatoractively shepherding the visitor through the transition from a frenetic urban context into the spaces of contemplation that awaited within: “It should transform the vitality of the street into the sincerity and profundity of art.” More than half a century later, Breuer’s conception of art can sound quaint; the last show the Whitney held in his galleries before moving on to more expansive accommodations downtown was a staggering Jeff Koons retrospective, where at least one of those qualities was conspicuously lacking from the art. But it is Breuer’s very notion of the museum as a space apart that seems most out of place in today’s pumped-up art world. The vitality of the street has been welcomed inside, particularly as both urban public life and cultural tourism have been reduced to the common denominators of entertainment and consumption. While the Whitney’s new home, designed by Renzo Piano, is almost 400 percent larger (220,000 square feet to Breuer’s 85,000), it includes only about 50 percent more gallery space (50,000 square feet to Breuer’s 33,000). The increased area introduces an impressive range of amenities, from an education center and theater to a state-of-the-art conservation lab and a black-box performance and screening room, as well as a street-level retail shop that the Whitney, in a strikingly direct inversion of Breuer’s description of his building, says “contributes to the busy street life of the area.” Indeed, while Breuer’s iconic inverted ziggurat offers a seductively ambiguous gesture perfectly in keeping with his idea of a transformative architectureopening a wide gulf between sidewalk and museum interior even as it simultaneously draws visitors across and into the shelter of its welcoming overhangPiano’s sprawling structure embraces its environment at every turn, not just physically interpenetrating the High Line but also framing views of the Meatpacking District and Hudson River through the vast spans of glass that bookend each of the main gallery floors. If Breuer’s structure still looks a bit out of place among the staid facades of its flanking brownstones, the crowds fluidly circulating between Piano’s building and its surroundings show that the new structure is already as much a part of the neighborhood as the High Line itself. All this makes sense given the brave new world museums now inhabit, and the Whitney is hardly unusual in its radical transformation. What is unique, however, is that it moved on so completely, abandoning a masterpiece for ground-up construction. As the nature of the art museum has evolved, modernist icons around the country have sprouted appendages: Edward Larrabee Barnes’s Walker Art Center in Minneapolis (1971) was significantly expanded by Herzog & de Meuron in 2005, and Piano’s extension of Louis Kahn’s 1972 Kimbell Art Museum in Fort Worth opened in 2013, to name just two examples. The Whitney had repeated brushes with a similar fate, including a long string of proposed additions: several in the ’80s and early ’90s by Michael Graves, one by Rem Koolhaas in 2001, and a nine-story tower by Piano in 2004, before his plan for the new site downtown. In a welcome but utterly absurd irony of the arcane workings of architectural preservation, Breuer’s building was saved not by any recognition of its own value as a discrete work, but by its nondescript brownstone neighbors, which happen to be landmarked. The fact that they are zoned for protection, combined with good old-fashioned Upper East Side NIMBYism (the Carlyle hotel was one of the plaintiffs in a lawsuit to stop Piano’s addition), effectively rendered the expansion of Breuer’s building impossible and necessitated the Whitney’s move. In 2011, the Metropolitan Museum of Art, just a few blocks northwest, announced that it would be stepping in to lease the old Whitney to display its collection of modern and contemporary art. And when the newly rechristened Met Breuer opens later this month, visitors will be presented with a kind of living fossil, an architectural coelacanth: a museum building from another era that wasn’t forced to evolve in tandem with its parent institution. The Met’s stewardship promises to help us see Breuer anew. In part, this is thanks to a meticulous, if subtle, restoration effort that brings no dramatic changes but peels away some of the ad hoc alterations that are inevitably made to a building during fifty years of use. 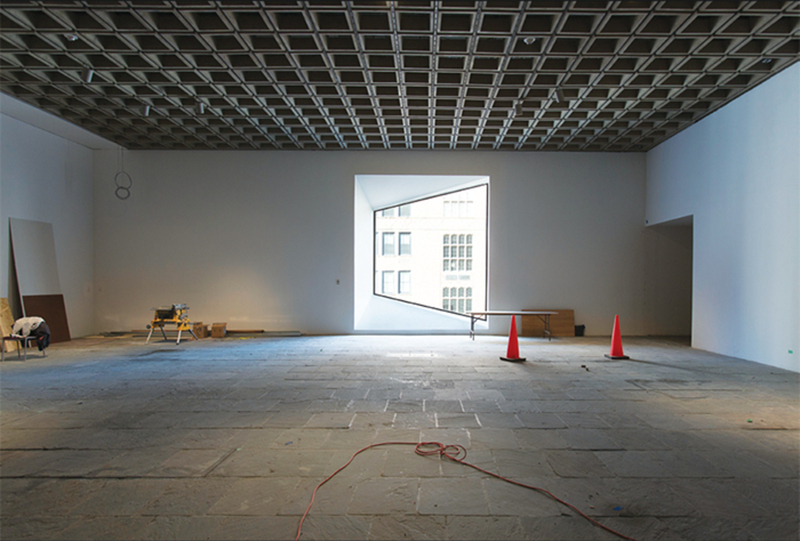 Among the most notable moves are the removal of a soffit over the coat check on the entry floor, which helps to reestablish the spatial continuity of the lobby; the landscaping of the sunken court on the ground floor, always a dark and somewhat difficult space, with a row of quaking aspens, bringing it closer to Breuer’s vision of a vibrant sculpture garden; and the reapplication of Breuer’s original low-sheen wax finish to the signature bluestone floors. This last change sounds almost imperceptible but cuts back significantly on distracting glare in the galleries, and lets the stone’s varying shadesfrom delicate ocher to deep indigoemerge. But above all, the Met is simply presenting the building in a new light. Unlike the Whitney, the Met has the luxury of treating Breuer’s building not as a flagship location or identity piece but as another object in its holdings of modern art. Now that Breuer’s design is no longer tasked with housing an institution or presenting an entire collection, we are free to more closely examine the building itself, to give it the kind of fresh look it may not have received since it opened in 1966. Back then, reactions focused on its idiosyncratic massing, which most observers took as an indication that Breuer was more interested in making a formal statement than in designing a functional space for viewing art. In a pair of 1966 New York Times articles defending the building, critic Ada Louise Huxtable acknowledged that “undoubtedly” it was “the most disliked building in New York.” And yet, comparing it to Frank Lloyd Wright’s Solomon R. Guggenheim Museum, which had opened in 1959, she argued that Breuer’s stepped cantilevers produced not just a monumental sculpture but a logical organization of well-designed gallery space: “In a sense . . . the building is its own exhibit. But unlike the Guggenheim, it is not the whole show.” To our contemporary sensibilities, conditioned by two decades of the Bilbao effect, Wright’s design seems positively understated, and the elegant rigor of Breuer’s layout is even more striking. Whereas Wright, with his famous ramp, merged gallery and circulation space, setting the stage for subsequent generations of museums in which crowd control would become as important as contemplation, Breuer maintained a clear separation between the two by sequestering the main stairs along the south edge of the building. Yet the stairwell is by no means an afterthought; intimately scaled, with plentiful natural light and low, heavy terrazzo benches tucked into each landing, it’s a space to pause and linger. It is also a tour de force of architectural technique, with elaborately interlocking corner joints in the teak railings, subtly indented treads in the terrazzo steps, and massive bronze doors on pivots embedded in the floor. Today we reflexively associate Breuer with Brutalism, and the precast concrete facades of his larger institutional projects certainly helped to define that aesthetic, but the rich materiality on display hereHuxtable dubbed it “suave-brutal”is more reminiscent of the obsessive, idiosyncratic craftsmanship of Carlo Scarpa. Indeed, even if Breuer employed a knobby, bush-hammered concrete similar to that of Paul Rudolph’s 1963 Art and Architecture Building for Yale University, he reserved it primarily for his interiorsespecially the lobby and stairwell, where viewers would be guaranteed a close encounter with its craggy physicalityand used a luxurious flame-treated granite exterior to establish the public face of the museum. Yet the most remarkable thing about the building today, when museumgoers are accustomed to either the bland vastness of hangar-like “column-free” spaces or to stupefying mazes of identical white cubes, is the thoughtful specificity of Breuer’s galleries themselves. While Breuer made it clear that he wanted “the visitors’ attention reserved to the exhibits,” he also refused to design generic galleries, warning that “large open gallery spaces with interchangeable partitions have to be watched, otherwise the general impression will be too clinical, too remote from the role of art.” Thanks to clever plays in the building’s vertical organization that belie the straightforwardly stacked boxes implied by its profile, the galleries vary in size and height, from the ample to the intimate. And while Breuer’s wildly eccentric windows provide each space with individual identity, they do not become overbearing: Sparingly deployedthere are only one each on the second and third floors and two each on the fourth and the fifththey do not interrupt the regular geometry of the floor plans with their outward protrusions, and the world glimpsed through them is always slightly distanced, estranged by their awkward angularity. Perhaps most important, white perimeter walls are complemented by the welcome texture of the bluestone floors and punctuated by the dense geometry and visual depth of a suspended concrete ceiling grid. As upmarket museum interiors (even those not designed by the same three or four architects) grow increasingly indistinguishable, Breuer’s galleries remain unforgettably specificeven if you haven’t visited the building in years, as soon as you emerge from the stairs or elevator, you’ll know exactly where you are. Today, the prevailing approaches to museum design proceed from the assumption that art and architecture are locked in an antagonistic struggle. The minimalist strategy tries to fade architecture into the background, lest it overwhelm the art; the sculptural expressionism favored by icon makers and their clients defiantly seeks the spotlight; the conversion of industrial or infrastructural spaces treads an uneasy middle ground, and seems to be gaining popularity because it allows a degree of idiosyncrasy (if not grandiosity) without requiring architects to claim authorship of it. But Breuer’s design reminds us that art and architecture are not in competition. Indeed, to think that architecture should, or even can, disappear from the museum is to deny that looking at art is inevitably an experience mediated by architectureone that plays out in parallel terms of space and material, light and movement. This capacity to frame experience is one of architecture’s ultimate powers, and the Met Breuer reminds us what can happen when great architects are asked not to provide brands or icons but simply to practice their own art. 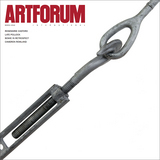 Julian Rose is a senior editor of Artforum.